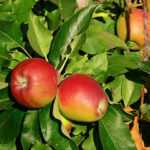 See below for fruit tree descriptions and info. Click “Shop Now” to be taken to our store and full inventory of trees. 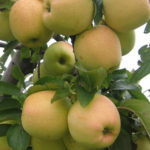 Attractive mid-sized tree with showy, pale pink flowers in spring followed by tasty, bright golden fruit. 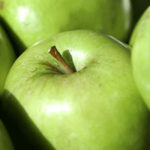 Golden Delicious is a good pollenizer for other apple varieties. Harvest in late September to early October. Deciduous. Sun to part shade. Fast growing and adaptable to various types of soil. 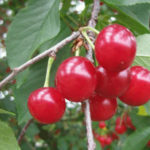 Ripen in early November, and keep their unique tart flavor through winter and even spring! Full sun. One of the most widely-grown apple varieties, the Gala matures to a bright overall red color, with bold red stripes over a yellow background. It is aromatic, with a sweet, slightly tart flavor. Full sun. Cold-hardy hybrid species that ripens early in the season. The medium-large bright red fruit has a firm yellow flesh; clear juice; and a rich, tart flavor that bakers and jam makers love. Full sun. A sweet cross with great looks and taste. 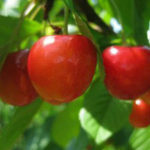 Tree bears gorgeous yellow-blushed-red sweet cherries that mature in mid cherry-season. Disease-resistant to brown rot, bacterial canker, and black knot. Full sun. 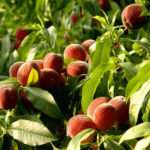 Espaliering can help keep your fruit trees in check while still providing you with a bountiful harvest. 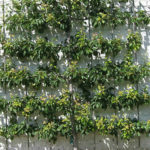 Implementing an espalier tree still requires maintenance throughout your growing season, but no more than any other backyard fruit tree. Full sun. Tree bears crops of large, attractive yellow fruit with a splash of crimson. Juicy, evenly yellow flesh is great for fresh-eating as well as freezing and canning for extended enjoyment. Ripens in September. Full sun. 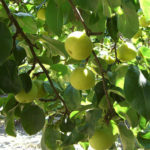 Hardy tree produces a heavy crop of fruit. 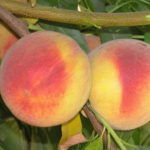 Fruit is medium-to-large with a sweet, peachy flavor. Features a flush of pink flowers in spring. Ripens in early August. Full sun. Ornamental fruit tree for your yard. The fruit is delicious, nutritious and easy to grow. As an added benefit, you’ll get a show stopping ornamental during every season. Full sun. 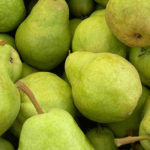 The #1 pear worldwide! Starts bearing at a young age and is very productive. Fruit features a smooth, firm texture and a juicy, spicy taste. Harvest in late August. Full sun. 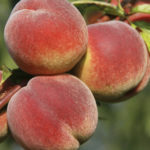 Enjoy bushels of large peaches with almost fuzzless skin over firm, creamy textured yellow flesh. Tree is heavy-bearing and easy to grow and maintain. Blooms late to avoid spring frosts. Branches have a spreading nature. Full sun.